As I reclaim my old love of archery, and in the never ending pursuit of experience, I decided it was time to try my hand at revisiting armour. Recently I obtained a leg vice that is the perfect height for holding various tools that the hardie hole in my anvil cannot accommodate. Because I did not have any legitimate sheet metal tools on hand, I made my own out of a few simple hardware store finds. 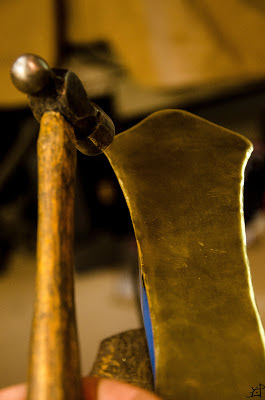 The first is a long, slightly rounded chisel used for masonry. I redressed the edge and gave the length a slight radius so the corners would not cut into the metal as I hammered down on it. 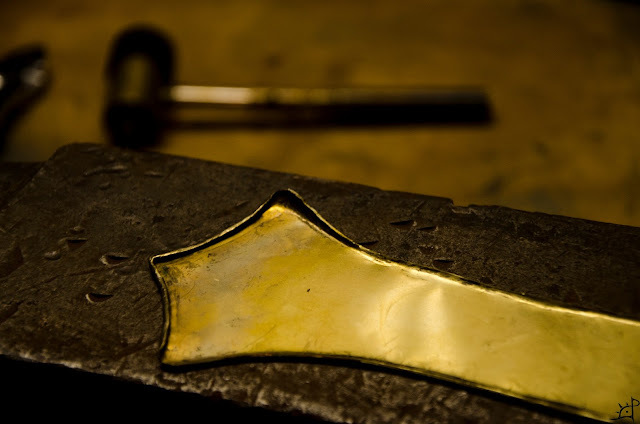 The second is a smaller chisel for more precise work of the same nature. The third is a trailer hitch to use as a rounding anvil. Finally, I found a log and cut it into a few pieces, one with a V in the top for rounding, one flat for fixing dents and whatnot, and a third as a half round log for similar purposes as the hitch. 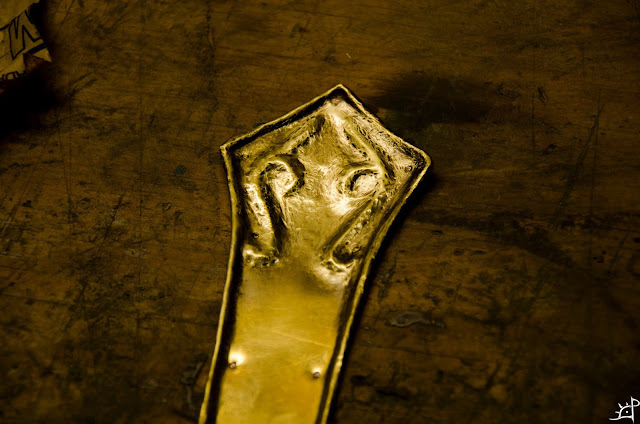 The hodgepodge collection of tools first found their use in making the first in a pair of vambraces, pieces of armour that cover the lower arm. That was really an experiment leading up to the armguard. More on that project (hopefully) to come at a later time when I can get back to the shop. 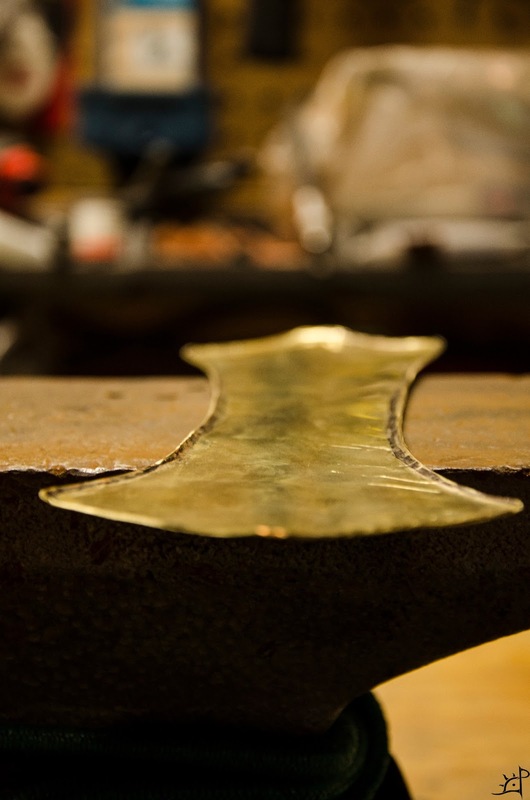 In brass instead of steel, this project was a bit different and is leading up to a bridge into the world of repousse. 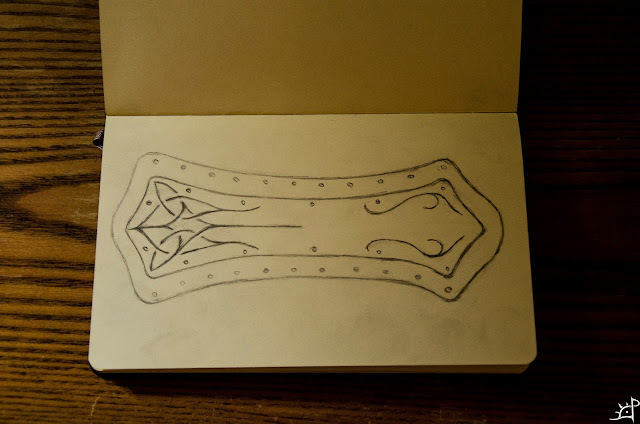 At its final stage, which it is only just barely touching, the armguard will be hammered into the knotwork design below and backed with leather. The brass portion will be the interior, while the bordering will be leather. Holes for the rivets and eyelets respectively were drawn in only for reference. 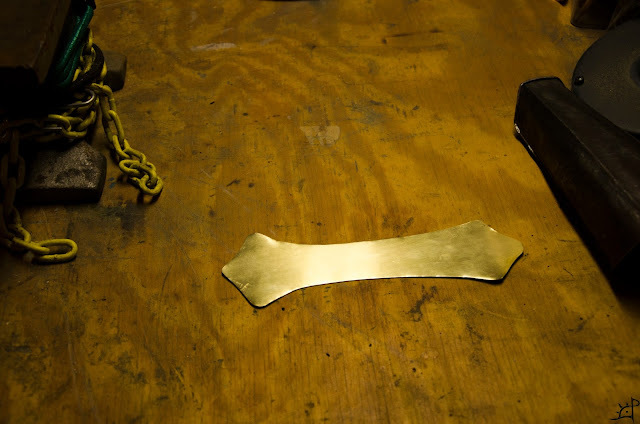 The lines on the brass will be where the metal is hammered up, creating the ridgelines. I should probably always give this disclaimer, but, as usual, I have virtually no idea what I am doing. When the results work, they work, and when they do not, I try and understand why so I can make better attempts in the future. Experience, in my opinion, however obvious it sounds, is every bit as valuable as reading about it or watching someone else do it. The first step, logically, was to sketch the pattern for the brass in full scale on the workpiece. Symmetry has long been one of my mortal enemies, so instead of trying to get the proportions just right, I drew one half on a piece of paper and traced it both directions. The brass I used is none too thick, given the only thing it should ever have to endure is the slap of an errant bowstring. Also, part of the reason I chose brass is because it is soft enough where it should not damage the string too much. Cut out with a pair of tin snips and smoothed on the belt sander, here is the blank. Nothing too spectacular here. At this point, I measured it again against my arm to see that it would be the proper size. For archers' armguards, it does not need to cover the entirety of the forearm, but I made it nearly that long for aesthetic purposes. I hammered until the entire perimeter had a corner about as tall as three times the metal's thickness. For the vambrace, the sheet was much thicker, so the corner was more pronounced. From there, I folded it inwards on itself and hammered mostly flat, using the top of the chisel to keep it rounded. 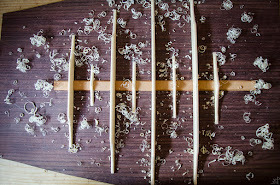 Then I began a second corner and rolled it over, making a nice smooth, tight scroll that followed the entire piece. The corners were especially difficult, for if I was not careful to keep the edge rolled, the metal would tear apart and become effectively ruined. For the sharp corners, I found it easiest to keep the curve gradual and hammer it to a sharper point after the scroll was completed. Another difference between the two pieces is the weight of the hammer I used. 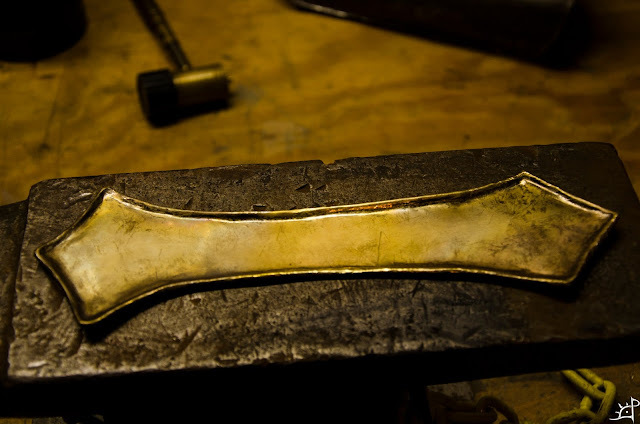 For the vambrace, I wielded a redressed ball peen hammer that weighed somewhere in the range of 8 ounces. For the brass, the hammer was less than half that. 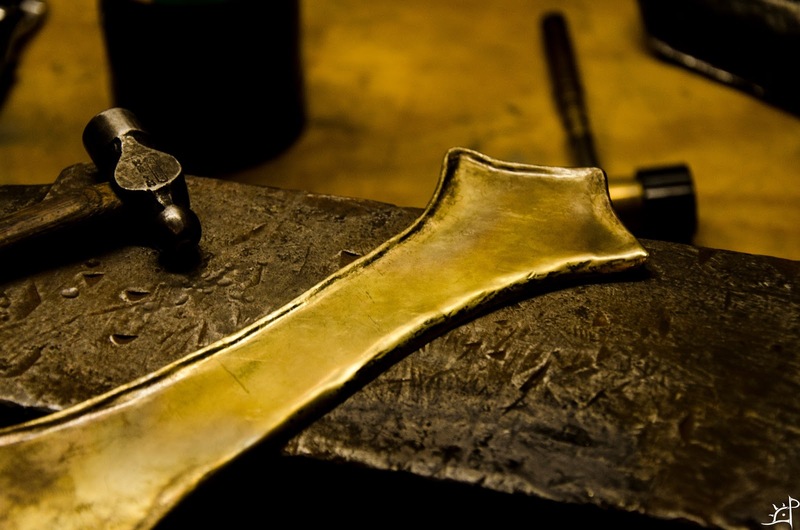 It is not necessary to beat the metal into submission. Many lighter, precise hits are far more effective and far less damaging when swung awry. For the armguard, however, things happened a bit differently. Because of the geometry and thickness of the brass, the scroll looked out of place. Where the transition between rolled edge and flat sheet came to a head, the gap was unappealing and difficult to keep straight. 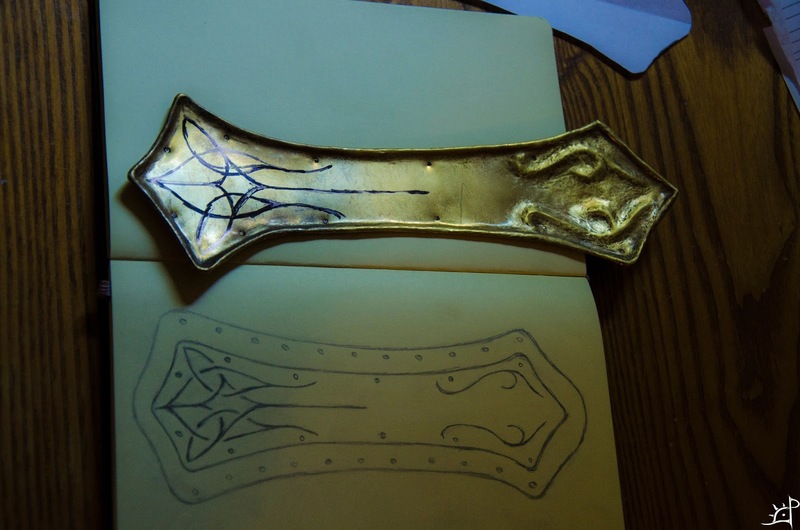 Unlike with the vambrace, the brass was for obvious reasons much softer and, less obviously, much more difficult to bring to a precise geometry using simple tools freehand. To rectify this situation, I decided to use the rolled edge as an upsetting device by which to border guard. Above shows the rough beginnings of this effect, with the bottom edge merely the underside of the scroll. This produced a much more clean, subtle border than the almost garish rolling used before. To keep everything round, I used the edge of the chisel to support the underside of the scroll so I could hammer on all angles. With the entire piece edged, it was time to begin the upsetting. 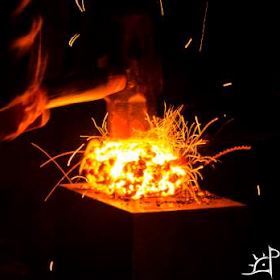 Before that, I would like to note how important it is to use frequent annealing when doing heavy manipulation of metal. Brass work hardens rather quickly, and without it, stress fractures and cracks will begin to appear everywhere. In order to combat this, I heated it to a dull red with the lights off and quenched it in water. Unlike ferrous metals, quenching does not harden, but rather relieves internal stress and softens it. If you do not believe me, grab a piece of brass and hammer the end into a random shape for a while, and then anneal it this way. Hammer it again and you will be surprised by how much easier it is to manipulate. Achieving the shape pictured above was more difficult than I expected, especially in the split of the curve and the ends. Placing the line directly on the chisel and hammering down from the sides pushes the metal everywhere save on the point down and away, creating the illusion of raising it (which for all intensive purposes is the same thing). 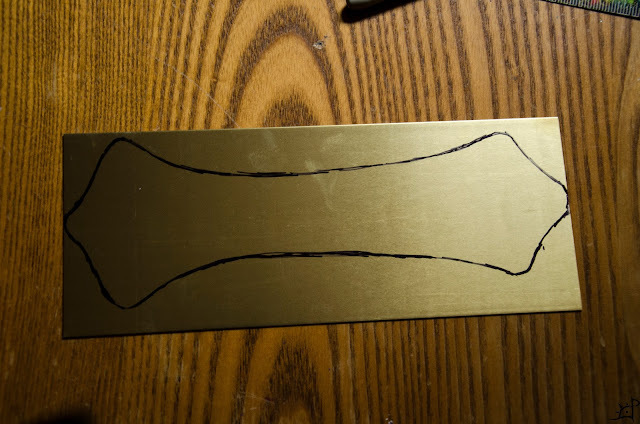 Before deforming the metal too much, I marked the places for the rivets with a centre punch. Later, I will join it with the leather in those spots via hand made rivets. Although it appears rather dirty, the reflected light throws off the effect. Of course, there are many hammer marks and marred lines where I went back to clean up the depth with a sanded down bolt, but that is far from the final finish. The back end of the guard was much more of a challenge. Intersecting lines and symmetry all played a dangerous game. One which, after several hours, produced reasonable results given the circumstances. 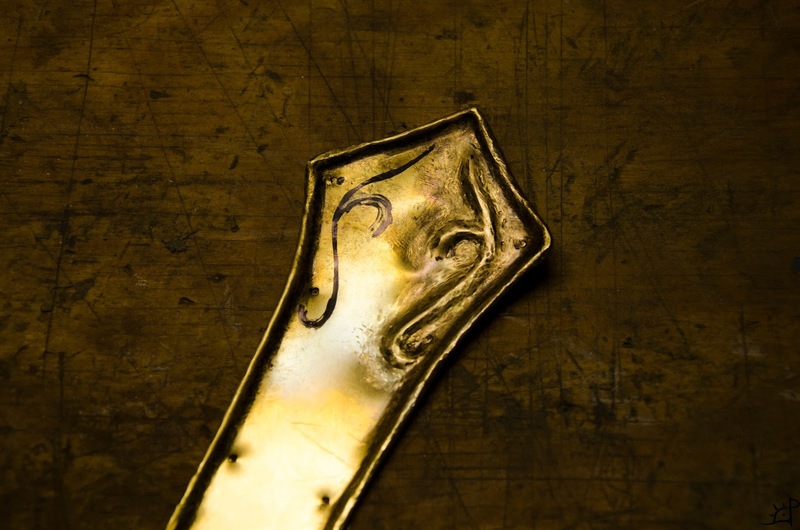 The real purpose of this experiment was to prepare the brass for repousse work, which is a very different animal. 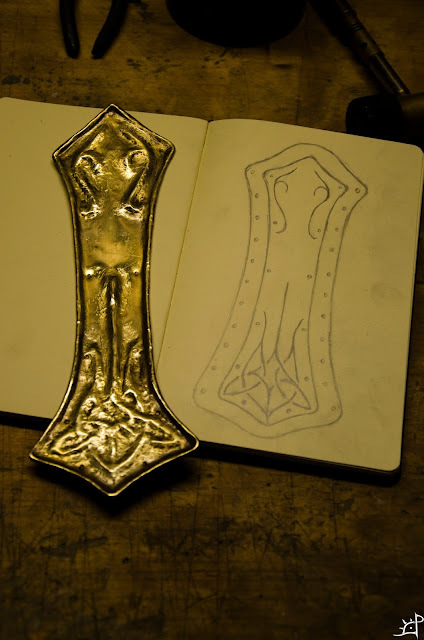 While it would have made far more sense and likely produced a better result had I started with repousse immediately after finishing the scrolling, that is beside the point. Soon, I will return to this project with planishing tools and a pitch pot to really make the design clear, crisp, and even. Until then, here is the result of this enlightening little experiment.